Strain-dependent phenotypes (embryonic or perinatal lethality): death in utero due to defects in placental spongioblasts; after birth: progressive neurodegeneration and abnormalities in multiple organs, including brain, skin, lung, eyes, GI tract, and hair follicles. Insufficient heart development, with trabeculae malformation in ventricles. 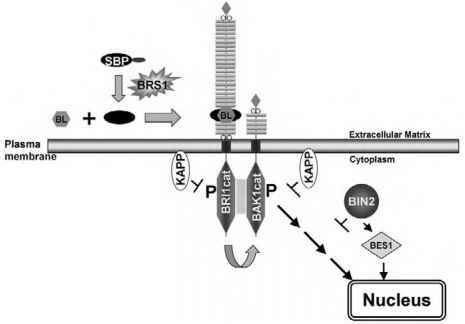 Introduction of transgenic ErbB2 into myocardial cells results in perinatal lethality and nervous system defects, including lack of Schwann cells, defects in motor and sensory neurons and neuromuscular junctions. Defects in valve formation in heart development and nervous system defects, including neural crest defects, lack Schwann cells, degeneration of peripheral nervous system. Insufficient heart development and trabeculae malformation in ventricles and central nervous system defects, including hindbrain innervation. Figure 1 ErbB ligands, receptor tyrosine kinases, and signal transduction pathways. 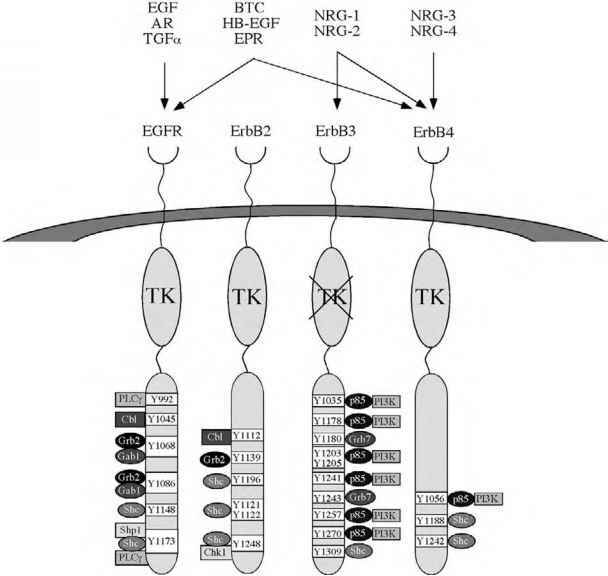 Ten growth factor ligands bind ErbB RTK: EGF, amphiregulin (AR), and transforming growth factor-a (TGF-a) bind EGFR; betacellulin, heparin-binding EGF-like growth factor (HB-EGF), and epiregulin bind both EGFR and ErbB4; the neuregulins (also called Neu differentiation factors; NDFs) NRG-1 and NRG-2 bind ErbB3 and ErbB4; and NRG-3 and NRG-4 bind ErbB4. Ligand binding induces receptor homo- or heterodimerization and activation of tyrosine kinase activity. Phosphorylation of tyrosine residues within ErbBs enables the recruitment of SH2 and PTB domain-containing proteins. The binding sites for such molecules are indicated and include adaptor proteins such as Grb2, Shc, Grb7, and Gab1 and enzymes such as PLCy, Chk kinase, SHP-1 phosphatase, p85 subunit of PI3K, and Cbl, a ubiquitin ligase. stroma-derived ligands. Three PDZ-containing proteins (Lin-2, Lin-7, and Lin-10) are implicated in the regulation of LET-23 localization. In addition, the PDZ-containing proteins PSD-95 and Erbin, as well as their binding partner PICK1, are important for ErbB2 targeting to and retention and clustering at specific cell surface sites in mammalian cells. In resting cells, a large proportion of EGFR, as well as ErbB2 and ErbB4, is localized in caveolae, which are membrane microdomains enriched in caveolin proteins, gly-cosphingolipids, and cholesterol. Caveolae are thought to regulate signaling through the preassembly of signaling molecules and have also been implicated in non-clathrin-mediated internalization. Caveolin-1 interacts with ErbBs and inhibits their catalytic activity. In response to ligand, both EGFR and ErbB4 migrate out of caveolae, which may remove the inhibitory effect of caveolin. Interestingly, the localization of ErbB2 in caveolae is unchanged upon stimulation . In addition, some signaling pathways induced through ErbBs, notably the Ras-MAPK pathway, were observed to occur in caveolae. The significance of the cave-olar retention of ErbB2 as well as the function of caveolae in regulating signaling and endocytosis of ErbB RTK remain to be fully elucidated.